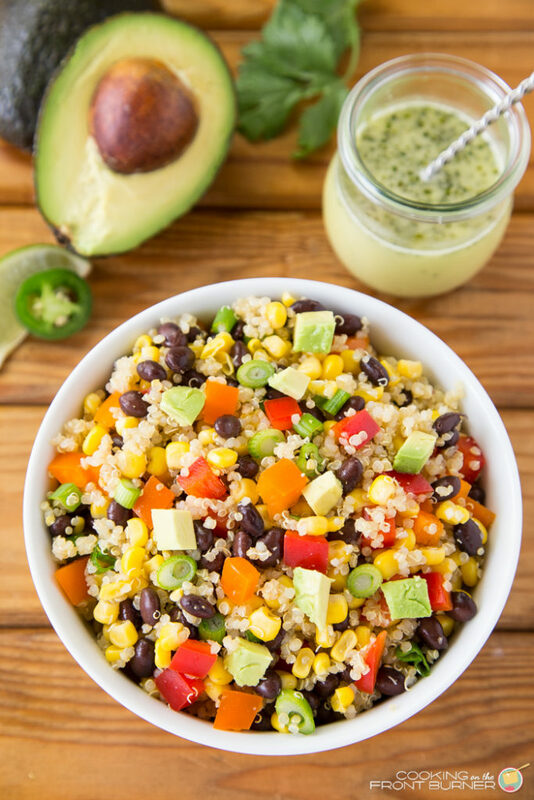 This Mexican Quinoa Salad is full of fresh ingredients and has a zippy jalapeno vinaigrette! Get your veggies today with this perfect side or main dish. Spring has arrived and I’m so in the mood for lighter food with brighter colors that are full of flavor. That is where this Mexican Quinoa Salad comes in. 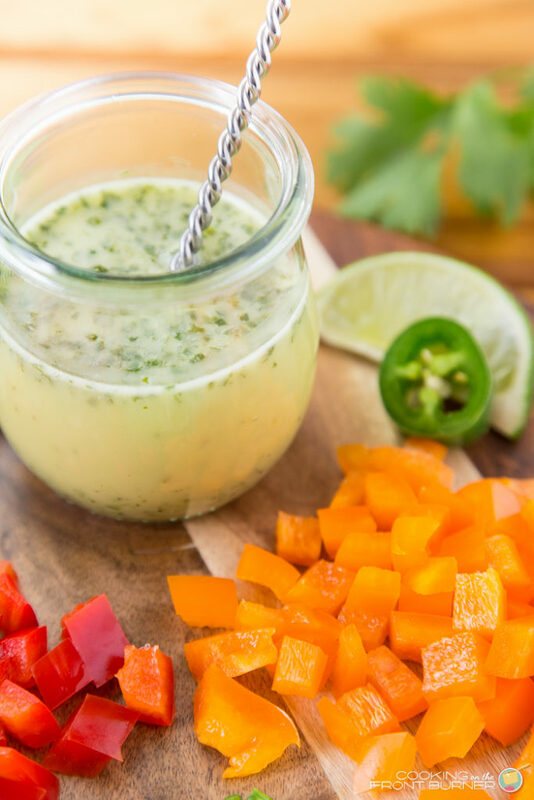 It’s full of fresh ingredients and has a zippy jalapeno vinaigrette that perfectly helps marry the salad together. I guess it is just that time of year where I’m looking beyond comfort food and start incorporating some lighter fare. I really love Mexican flavors – could it be the black beans, corn, avocado, peppers? It’s all of that plus the jalapeno vinaigrette as well! Your taste buds will come alive when your fork hits your tongue. 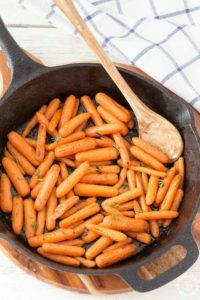 With Cinco de Mayo coming up in about a month or so, this would make a great side dish along with a side of some burritos (and a margarita). 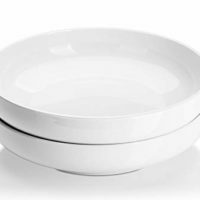 Also keep it in mind for summer picnics as well – your friends and family will thank you. 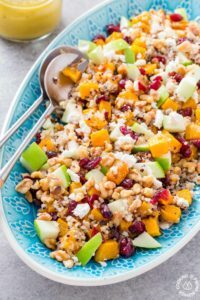 As I always mention, you could definitely add some of your favorite ingredients to this quinoa salad recipe. Maybe some different peppers, red onions and if you wanted to make this a complete meal, some cooked chicken would be a great addition. The dressing wasn’t too spicy but I think it might get a little spicier as it sits. I only used about 1/2 of a medium sized jalapeno. If you like spice, then definitely add some more. I did not use all the dressing but you certainly could depending on how much you would like. 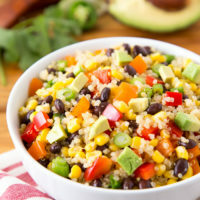 Hope you enjoy this tasty Mexican quinoa salad recipe! 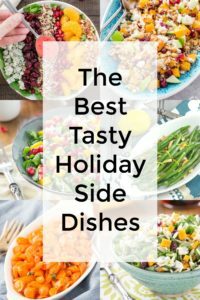 Would love to know what other salads you might like! Other of our favorites are these two – Mexican Street Corn Salad and Crunchy Apple Almond Salad with Poppy Seed Dressing. 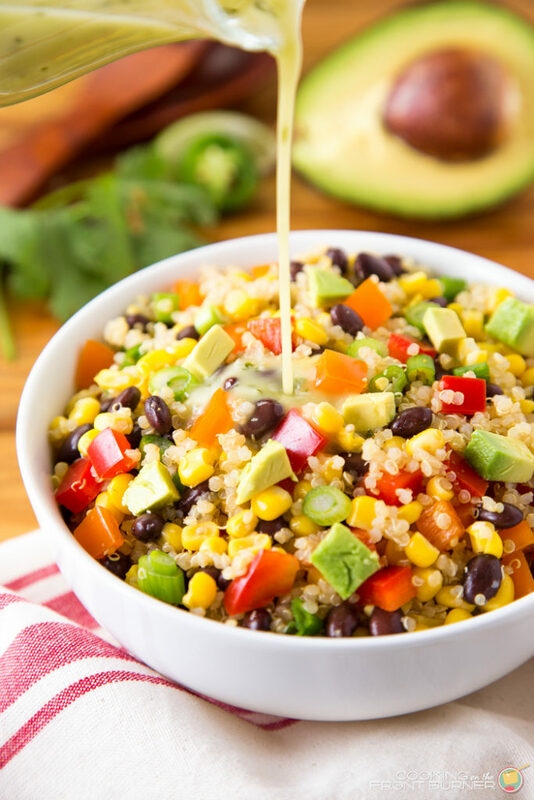 Pour that tasty dressing over your Mexican quinoa salad! 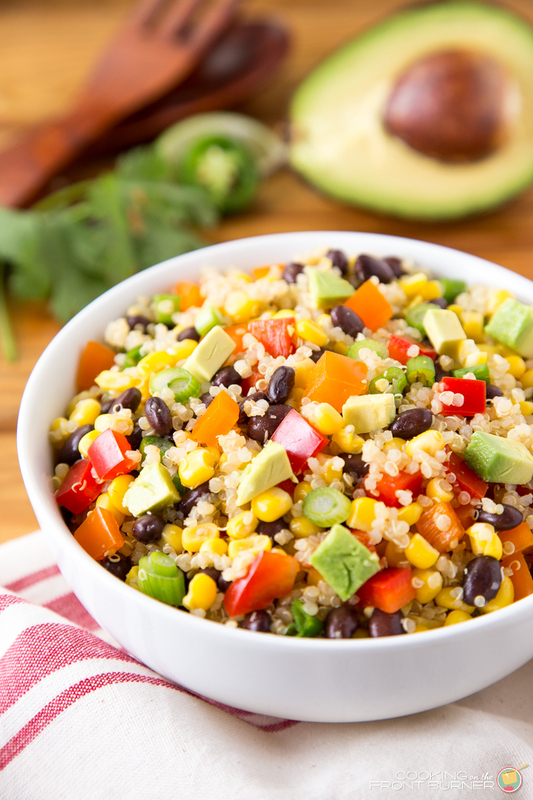 This Mexican salad is bursting with wonderful flavors and fresh ingredients! Thanks Meaghan – I agree with you – I find quinoa very versatile! That is a beautiful salad…loving that vinaigrette. 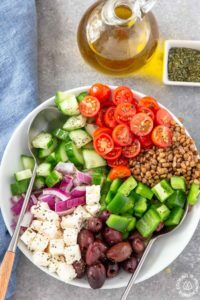 I love colorful salads – they're beautiful in presentation and they usually provide a wide array of textures and flavors! I love these flavors….and that vinaigrette! 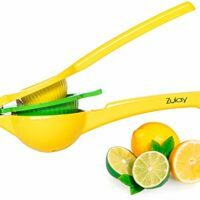 I would use it on everything! I know – it is pretty amazing! Thanks Carrie! It's a great flavor combo! This is absolutely gorgeous! And this Jalapeño vinaigrette is screaming my name! This is awesome! Such a pretty salad! Deb, this is gorgeous is just the way I like to eat! That vinaigrette sounds amazing, and I can't wait to make this! Oh this looks so colorful and tasty! The vinaigrette sounds so delicious as well! This looks so yummy! I will be trying it this weekend. Thanks for sharing! This is my kind of salad! I would want to use that vinaigrette on everything! Such a gorgeous salad! 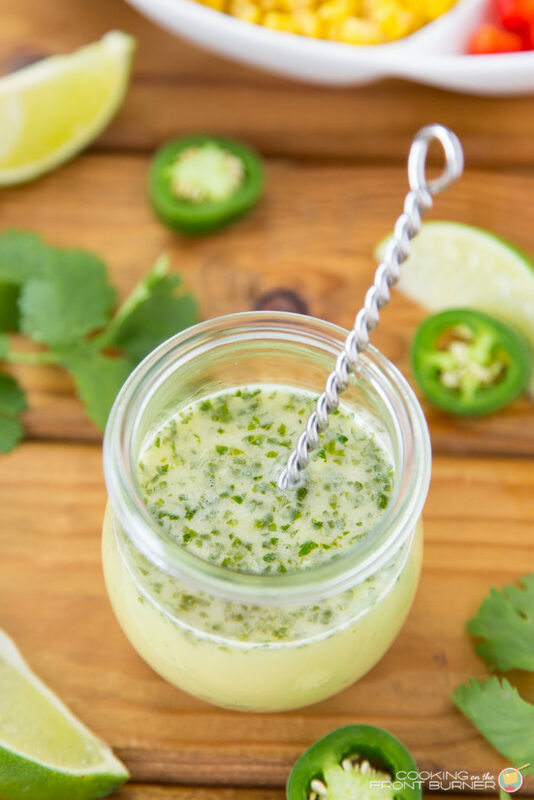 And yes, I'm with you on loving all those Mexican ingredients – especially when they're served up so healthy and fresh like this 🙂 Perfect spring and summer recipe. And the vinaigrette sounds awesome, too! Pinning and can't wait to give it a try! This looks incredibly delicious! I love the sound of that dressing! 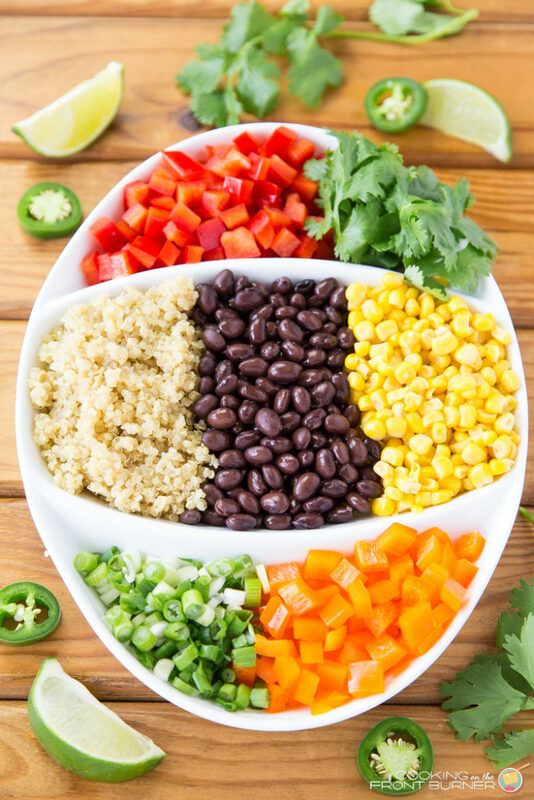 I love quinoa and how versatile it is! This looks amazing! Sounds great, esp the vinaigrette! It's apple cider, not apple cider vinegar? Just making sure. Thanks! It is vinegar – missed on my part – thanks for catching – now updated! I enjoyed this salad a lot! I'm so glad I tried it! Very fresh and tasty! Hi…that’s a lovely salad. Awesome presentation, may I know where the vinaigrette jar is from? Have you tried making this a day or two before you want to eat it? Hi, I have not tried that – if you do, don’t add the salad dressing until right before eating. This quinoa salad is SO good! I wanted to keep it all to myself. I had some leftover and it was even better the 2nd day. Wow – glad to hear you liked it!! Every time I make this I’m asked for the recipe. Only thing that confused me was the cilantro in the bowl with the veggies and also in dressing? I kind of did both as I wasn’t sure where it was supposed to really be. Yes, it is in both places… I’ll note that in the recipe – glad you enjoy it! I never comment on blogs, ever. But I have to comment here! I saved this recipe on Pinterest and have made this countless times! My boyfriend loves it, friends love it, and my boyfriend’s mother now wants the recipe! This is truly an amazing recipe! Especially that Jalepeño Lime Vinaigrette. The combination of the salad and the vinaigrette is absolutely heaven on earth! Thank you so much! Oh boy, thanks for the review! It is our favorite too and so glad you enjoy it! could I use yellow mustard instead?